August 24, 2010 - Southwest Airlines (SWA) Flight 2294 departed Nashville International Airport, Nashville, Tennessee, on July 13, 2009 with 131 onboard a Boeing 737-3H4, N387SW. At approximately 35,000 feet, the Boeing 737 fuselage crown skin ruptured just forward of the vertical stabilizer. The passenger oxygen masks deployed automatically, the flight crew declared an emergency. The aircraft was scheduled to land at Baltimore Washington International Airport, Baltimore, Maryland but was diverted to Yeager Airport (CRW), Charleston, West Virginia with out further incident. The flight, had departed Nashville International Airport, Nashville, Tennessee, and was scheduled to fly to Baltimore-Washington International Airport, Baltimore, Maryland. The flight data recorder data revealed that the airplane took off and climbed for about 25 minutes to an altitude of approximately 35,000 feet. At that point, the cabin altitude warning activated, and the captain disengaged the autopilot and began a descent. The altitude warning ceased as the airplane descended through approximately 9,000 feet. Cockpit voice recorder data and post incident interviews revealed that the flight and cabin crewmembers followed appropriate cockpit procedures following the rapid decompression and during the emergency descent and landing at CRW. A three-sided hole (flap) was located in skin assembly in the fuselage crown skin near the leading edge of the vertical stabilizer and measured about 17.4 inches longitudinally and between 11.5 and 8.6 inches circumferentially. The airplane, was delivered to SWA in June 1994. At the time of the SWA event, the airplane had accumulated approximately 42,500 cycles and 50,500 hours. 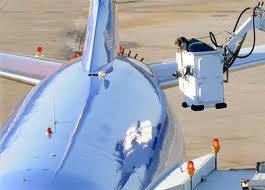 The captain had accumulated 22,500 total flight hours, 19,300 hours of which were in the 737. He held an airline transport pilot (ATP) certificate and a class one medical certificate with a limitation/waiver for corrective lenses. The first officer had accumulated 10,100 total flight hours, 2,240 hours of which were in the 737. He held an ATP certificate and a class two medical certificate with no limitations/waivers. Skin assembly parts are made of an outer sheet of skin, which covers the entire assembly, and a waffle-pattern doubler sheet hot bonded to the inner surface of the part. Both pieces were 0.036-inch-thick, 2024?T3 clad aluminum sheets. Boeing indicated that the skin assembly was manufactured by forming and bonding two full sheets together, then selectively masking and chemically milling away pockets (bays) of the inner doubler sheet to create a waffle pattern. The bay immediately adjacent to the rupture is not chemically milled to provide for possible installation of an emergency locator transponder (ELT) antenna. Magnified inspections of the fracture surface of the skin assembly part revealed bright faceted surfaces indicative of fatigue progress along the longitudinal section of the flap, which followed the chemically milled edge of the adjacent doubler. The circumferential crack regions displayed matte grey slant fracture surfaces and bulk deformation patterns indicative of overstress tearing away from the longitudinal portion of the crack. The longitudinal fatigue crack was 13.7 inches long from approximately BS 831 to BS 844. Highly magnified inspections of the longitudinal crack revealed continuous fatigue thumbnail cracks propagating outward (through-thickness) from multiple origins at the inner surface of the skin. The visual depth of the fatigue regions varied along the crack length. Near the middle of the longitudinal crack, the fatigue crack appeared to completely penetrate the skin thickness for a distance of approximately 3 inches. Scanning electron microscope examinations clearly showed microscopic features typical of fatigue progression, including areas of striations, in the longitudinal crack region. The specific area of rupture and skin cracking (adjacent to the non-chemically milled skin to allow for a potential rear ELT antenna installation) associated with the SWA event was not subject to any inspection airworthiness directives (AD) or service bulletins (SB). However, Boeing finite element modeling suggests stress levels are higher in the skin at the edges of chemically milled steps adjacent to non-chemically milled bays due to the difference in stiffness. Following the SWA event, on September 3, 2009, Boeing issued SB 737-53A1301, calling for repetitive external inspections to detect cracks in the fuselage skin along the chemically milled step at stringers S-1 and S-2 right and between BS 827 and BS 847. The hole from the SWA event was within those boundaries. The FAA issued Airworthiness Directive 2010-01-09, which mandated the inspection requirements in SB 737-53A1301.